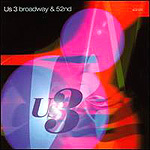 CD review: "broadway & 52nd"
This review first appeared in the April 12, 1997 edition of the American Reporter. All the talking heads on TV who so solemnly assure us that the killing of Tupac Shakur somehow proves rap is inherently violent or worthless ought to be forced to listen to Us3. The second outing by leader Geoff Wilkinson (Us3 co-founder Mel Simpson is no longer involved) and his rotating cast of rappers and musicians shows again that rap is merely a form; it is up to the artists involved to shape it, to give it value. One of the first acid jazz combos to break into the mainstream (via their 1993 debut album, "hand on the torch"), Us3 seamlessly blends rap vocals and a hip hop back beat with samples of historic jazz recordings and new instrumental improvisation and solos. The end result of all these disparate components is a danceable, listenable music that's equal parts entertainment and art. Like the dance bands of the Big Band Era, Us3 shows that it's possible to create a form that both delights and challenges. It also proves beyond any doubt that like jazz and blues  other African-American art forms once dismissed as gutter music  before it, rap can hold it's own in a high-brow environment. KCB and Sahdeeq give vocal performances that are sophisticated and classy while still conveying an energetic urgency. Perhaps most of all, "broadway & 52nd" is evidence that jazz continues to evolve, to adapt  to live.